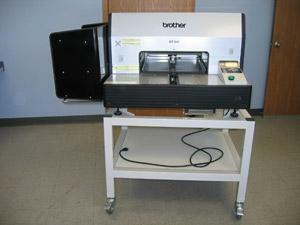 The Brother GT-541 uses ink jet technology that prints on many garments in high quality color directly from a computer. This ink jet garment printer is as simple to operate as a desktop printer, which can be networked with multiple units, to deliver great print quality and still remain cost-effective for short-run apparel graphics applications. The GT-541 is faster and less expensive to operate than traditional screen printing machines because there is minimal set-up, tear-down, clean-up, screens, squeegees, or pallet adhesive. The GT-541 water based ink can be cured by a standard heat press, eliminating the need to purchase a conveyor dryer, and significantly reducing operating space requirements. Imagine a garment printer that allows you to print directly from your computer or from a flash card, without all the set-up mess or high cost of traditional screen printing machines. 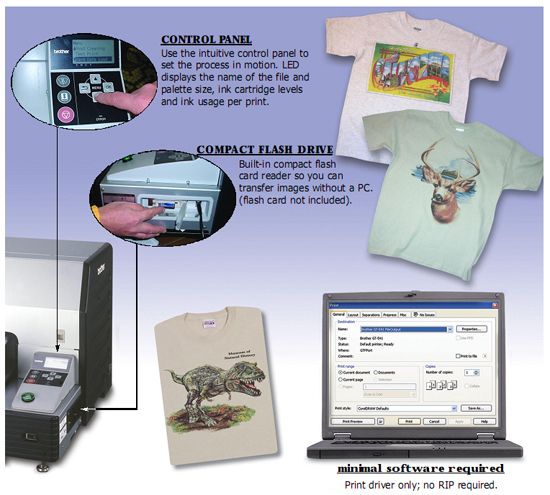 Our new GT-541 “Print on Demand” Inkjet Printer prints on most garments in full color , with a large 14" x 16" printable area. It’s as simple to operate as a desktop printer and consistently delivers high-resolution print quality. It is faster and less expensive to operate than traditional screen printing machines because there is no extensive set-up, teardown, clean-up screens, squeegees, or pallet adhesive. The durable water-based inks withstand repeated washings and can be cured by a standard heat press, eliminating the need to purchase a conveyer dryer. 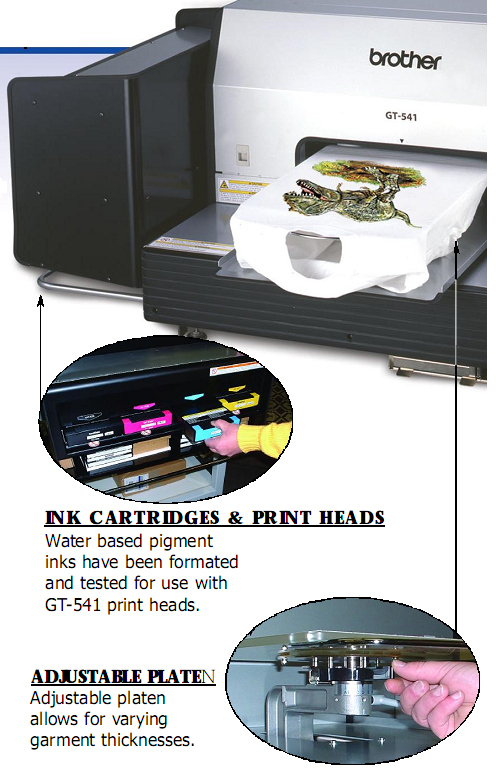 The GT-541 is designed for garment printing. Matching ink and print heads were developed specifically for printing on cotton and cotton/poly blended materials. It’s what you’ve come to expect from a leader in inkjet printing technology. Q. What type of printer is this? Q. How many colors will the printer produce? A. By using the 4-color printing process (CMYK) it can produce over 16 Million colors. Q. How is the ink supplied to the printer? Q. How long does it take to print a shirt? A. It really depends on the design, but a standard sized 10"X12" design can be produced in about a minute. A. Yes. Use a regular heat-press set at 356 degree F and press for 35 seconds. Q. What color of garments can it print on? A.We can print on white and many light or pastel color shirts, additionally some dark color shirts as well. Q. Can we print on dark color shirts? A. It depends on the color of the garment. But it cannot print on black due to the printer not having white ink. Q. What is the maximum printing size? A. It is 14" wide X 16" long. A. It depends on the amount of ink used. A standard design uses about one dollar worth of ink. Q. What is the machine's size and weight? A. The printer is 46.6" long x 37.0" wide x 24.0"tall. It weighs about 220 lbs. A. No. This printer works with regular AC power 115V (+/- 10%). Q. What types of fabric can it print on? Q. 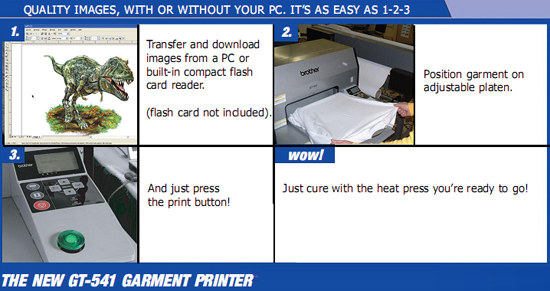 How is a garment loaded into the printer? A. The garment is slipped on to the printer's platen much like a garment is loaded on to a screen-printing machine. Q. Can you print on sleeves? A. Sure. It would be easier if you press the sleeve before printing and adjust platen height accordingly. A. No. Our ink is not transferable. A. Windows Vista, or Windows XP Home or professional, or Windows 2000. Q. Can the printer be used on a network of PCs? A. Yes. We can share one GT-541 printer with multiple networked PCs using Windows printer-sharing function.